Discussion in 'Outerwear' started by Carlos840, Jul 21, 2018. I had been looking at the Chopper for a while, but with Vanson recently changing their leather (not for the best), and the fact that they stopped making it in a size 42 (M=40, L=44) i was pretty sure i would never own one. That is until an older, still unworn size 42 turned up for sale on eBay, in Europe. As you can imagine i jumped on it and ended up getting it for a great price. The jacket arrived yesterday and it was just as described, actually new, never been worn, and a real beast! The hide really is something else, it is around 1.5 mm thick, super soft supple and heavy, with a very even grain all around. It is a very deep black, darker than my LL or Schott which are the only other cow hide jackets i have to compare. Putting it on feels like sliding into supple armor, taking it off feels like it should create suction sounds, it literally molds to you in seconds. It does squeak HARD! I don't think i have owned a noisier leather jacket, putting it through my patented "quick break in process" didn't change a thing. I don't know why, but only my Schott and this Vanson squeak like this, maybe an American trade secret? Construction is slightly below average, nothing really horrible going on but nothing really pretty either. I think it compares to my Schott 644, pretty rough around the edges, but fully functional. The collar stitching has a few crooked stitches here and there, the quilting has a few dodgy stitches too, the stitching around the pockets is not square at all (well, left side almost is, the right side is a parallelepiped, not a single 90 degree angle...). 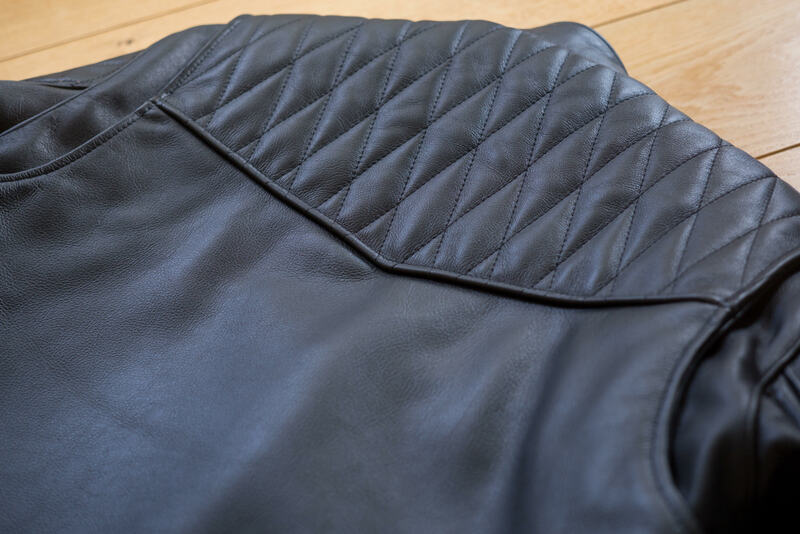 A lot of the seams on the inside have not been rolled and pressed flat like they do on most jackets and you can really feel them through the lining. The ones in the arms for example are very aggressive, stand straight up and rub the inside of your arms pretty hard. 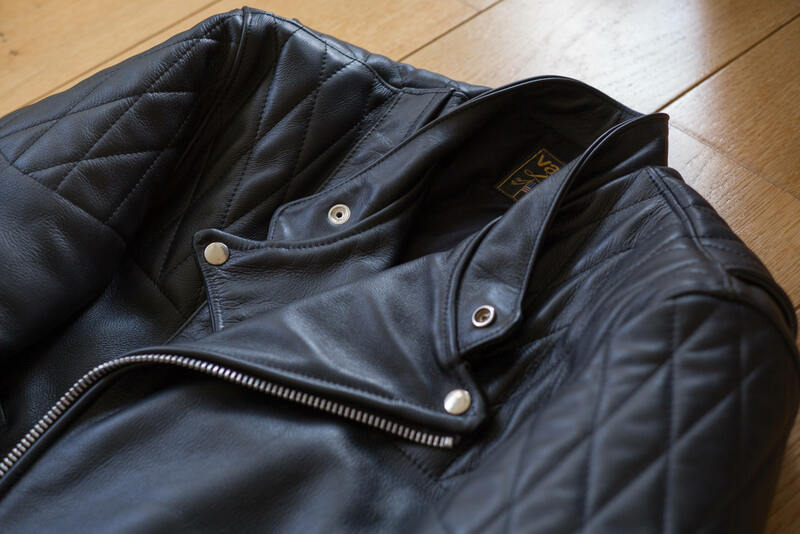 Don't get me wrong, it's not a badly made jacket, but it doesn't have the effortless perfection and attention to detail that my Freewheeler LaBrea shows. This is rough and tough! Another negative IMO is the use of a plastic zipper pin and box, they say it is an upgrade and better than brass, but my mind struggles with the idea of plastic being better than brass. I am also not a fan of the unstitched cuff ends, to me it makes the sleeves look unfinished. The lining is a very nice cotton fabric, very thin, with a softness similar to a cotton T shirt. Much softer than the classic drill we are used to. It has a proper gun pocket, leather lined and with a heavy duty clip, pretty cool in my opinion. The kidney panel feels like it could stop a bullet, i think it has some artificial material or something sandwiched in between the layers of leather, but it is very rigid and thick. 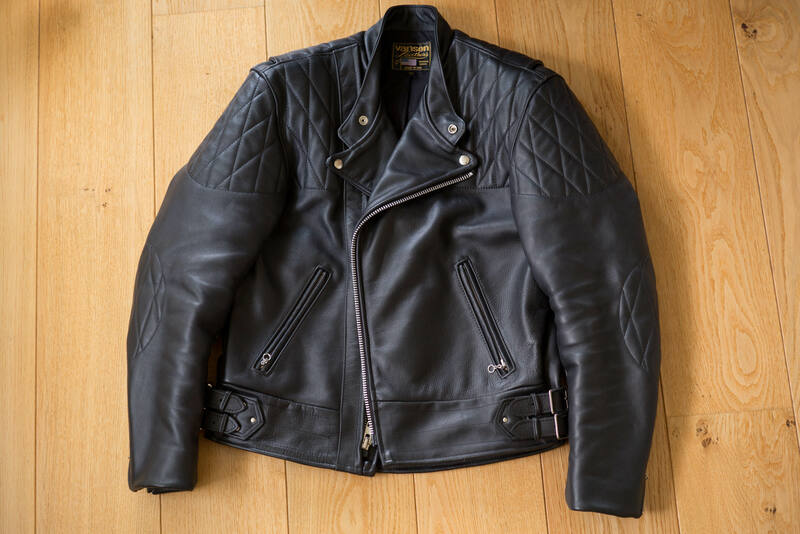 Fit is good, the arms have a nice forward curvature, the gussets are very functional and forward reach is great, it is a big bulky jacket but it doesn't feel like it is fighting me like my AL cafe racer did when it was new. The jacket looks pretty wide at the bottom because of thickness of the adjustment straps, but it doesn't look too bad. I have 33" waist and the waist feels good on the second to tightest adjustment hole. Overall, i am happy i got it. To me it has the same problems i see with Schott jackets, they focus on making them fast, not making them pretty. This was OK when they were worth $500, but I think that at the current price these could do with slightly better stitching/attention to detail, and no plastic on the zipper. Considering i got it for close to half price, and it is in a desirable and now unavailable leather, it is hard for me to complain too much. This jacket isn't a perfect masterpiece to be looked at and admired, it is a workhorse, and this is how i intend to use it. This is a riding jacket, not a walking jacket! I am now officially done for 2018! No more jackets for me. AeroFan_07, Bfd70, Boyo and 14 others like this. Man Carlos the fit on that is excellent. This is one of those jackets that looks better zipped imho. Quite a nice addition to your stable I'd say. I've been dancing around one of these forever. I fear your review may have pushed me closer to buying one than I can afford! Seen a few pop up used on the bay. Damn man. Nice! I do not believe your last statement. Great review. This thing is built to ride and be absolutely abused. And for some reason I love the squeaking of some of my Vanson. Couple of thoughts for others looking for a specific size in the Chopper. Call them and they will build one in your specific size. If you want a 42, ask them for a 42. 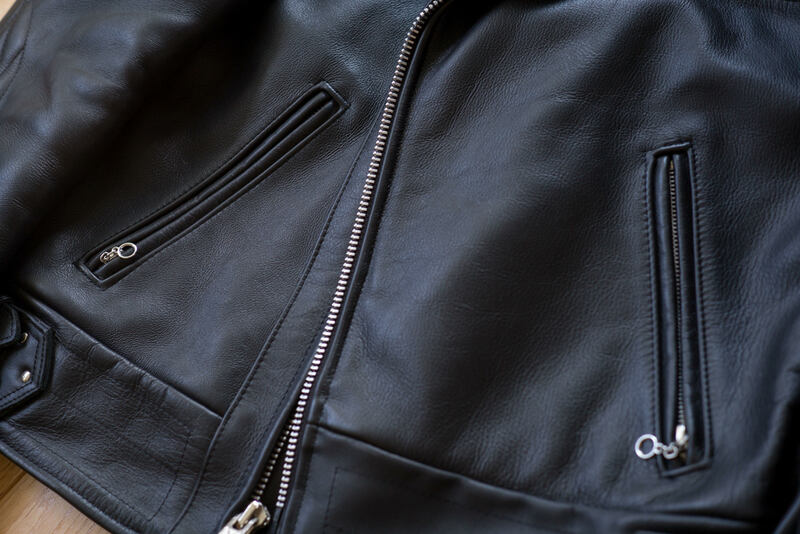 Mine has perfectly squared off pocket stitching and a brass zipper box— I asked for the box, actually a brass two-way zip, but perhaps the stitching was better on the entire jacket because I asked them to build one outside the normal assembly process? Or if a medium fits, call and ask for different stitching like I did. That would force more of a dedicated build and hopefully “better” details. That ain’t my thing but get that others may care. AbbaDatDeHat and Carlos840 like this. cool jacket congrats, it fits a bit loose on you on the body. I like un-stitched cuff, with wear and time it will settle and roll into nice shape. BTW my heavy cow also squeak after sometime, I think it is around the gusset. my other jacket with comparably heavy cow don't squeak but the jacket doesn't have shoulder gusset, maybe that's the culprit I don't know. After seeing the fit of your Himel Chevalier and the Freewheelers La Brea I have to say it will be very difficult to get close to that. The quality and fit of those two jackets is very difficult to match! 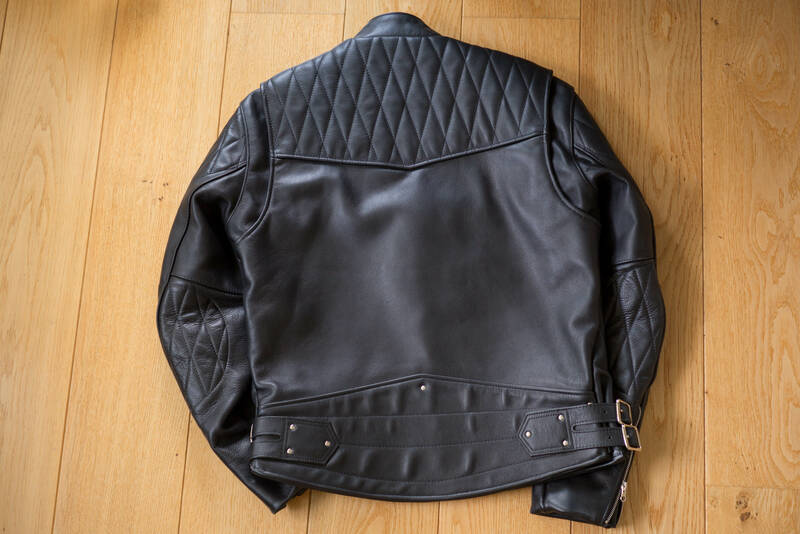 This jacket doesn't look as nice on you but it sure does look like a jacket that will take a beating and be perfect for riding. It's good that you didn't pay full price for it because I think those details you've noticed would be buggering you. The Chevalier and LaBrea fit much closer, but i can't wear more than a T shirt underneath them. The Chopper is roomier, meaning i'll be able to wear it with a thick fleece for winter riding, i might even be able to fit my back protector in there. I don't think i will ever ride with the Chevalier or the LaBrea, they just don't feel like they would save my skin. On the other hand, if i had to choose one jacket to wear whilst being dragged behind a car, it would be the Chopper, it feels invincible. It's not perfect, but it is still a very nice jacket. Boyo, El Marro, willyto and 2 others like this. You reviews are always interesting to read, as always thanks for sharing! Some riders like plastic zippers over brass because it won't scratch the pain on their gas tank. It's still a nice fit and while not as perfect as the Chevalier or La Brea, it's definitely important to have something that you can layer under. I think it looks pretty good unzipped, but cross zip jackets always look better zipped in my opinion. Very nice pickup. What a great score! Reading your first post on the jacket I was reminded of my first impressions when I receive my very first brand new Vanson jacket. I thought that the construction was a little sloppy when compared to an Aero or any other top tier maker. It definitely feels more like a piece of gear than it does an object of wearable art. My misgivings all went out the window when I begin wearing the jacket though Vansons are beautifully patterned and solidly built. This means that you can actually move around and get things done while wearing this heavy armor-like leather. With a little where it will be even better, congratulations! Bfd70, felix03, Carlos840 and 2 others like this. Looking good Carlos. I’ve had my chopper about 5 years now and it’s starting to develop some nice grain. The squeakiness is still there but a lot less than when it was new. 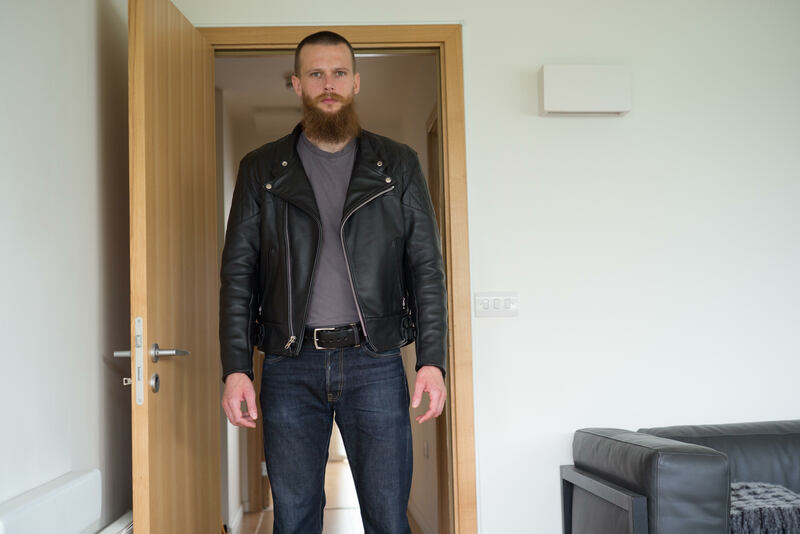 Agree about the fit — it’s slightly awkward when standing up but everything falls into place when I’m on the motorbike. FYI, I ordered mine with a 2-way brass zip. I just noticed another small detail, there is actually a stitch line missing from one of the quilted shoulders! Boyo and dudewuttheheck like this. Yeah, that certainly is not the norm. You know, you now own pretty much every single jacket from my 'Must have' list. At least you will if you get LL Universal Racer Mk.2. As biased as I am toward Chopper, despite the tiny shortcomings, all of this just reminded me why this is my favorite number by Vanson. And I never before realized it's got such an insanely cool collar! 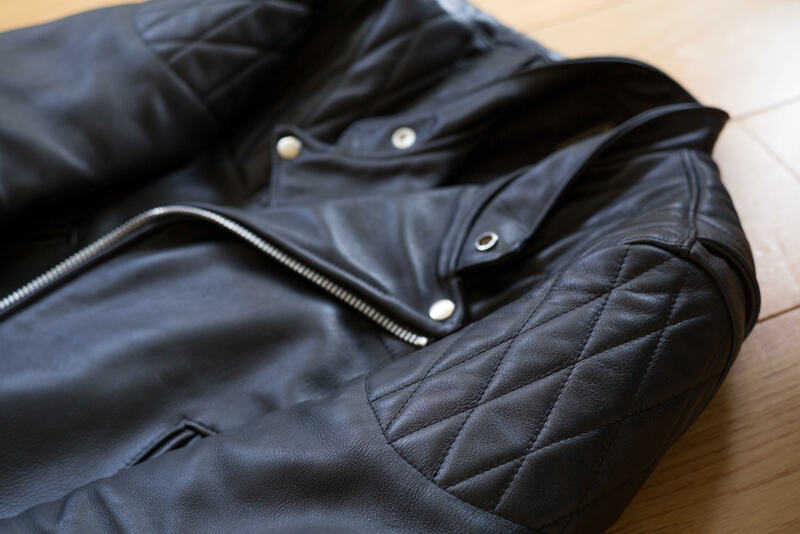 It may not be the most neatly stitched jacket you got but just by looking at it, no doubt there it's probably the most functional moto jacket in your collection and that's what Vanson's really all about. I think with time this one will grow on you. That's what always happens with Vanson. Of all the jackets I've sold, the only ones I truly wish I hadn't are Vanson. Now I with I didn't sell that cop jacket. I wasn't even wearing anymore... But either way, this jacket looks really awesome. And impressive. Fits you as good as it gets with an OTR jacket, especially one made in such a heavy hide. It's absolutely perfect when zipped up! And that hide, man... You're lucky you scored a jacket in it because it's not only rare in its own right - haven't seen them work with this mate/naked-ish hide in a while now - but considering what they're currently working in, second hand might just end up being the only way left to go when it comes to Vanson. JMax and Carlos840 like this. I emailed Vanson asking them if they had any idea when my jacket was made using the serial number. It was made in June 2016 for inssurection, to their specifiction. Not sure what is different between the Insurrection model and the regular one, or if the leather is specific to them, i asked, let see what they say. I think the main difference is that you have it in comp. weight, while Vanson usually builds them in the X-150. Makes sense. Insurrection occasionally had Vanson make jackets in unique leather exclusively for them. Carrie ought to know. 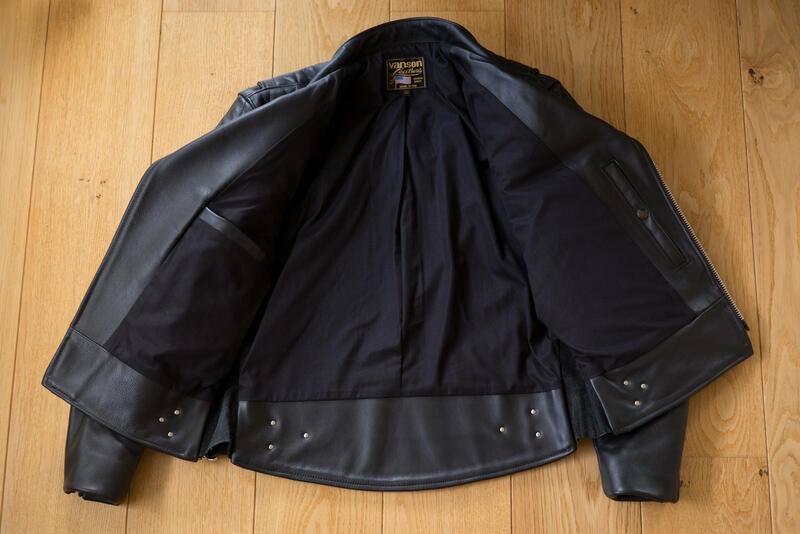 From Insurrection/TB website: "The jacket is made of Vanson's premium Competition Weight cowhide and is built for performance, looks, and longevity." From Vanson website: "STEER-XL BLACK WAXON 1.2 mm ( 3 OZ. ). Using recipes from before WW2 we use specially formulated hot wax applied by hand to..." This is the X-150. I recall Carrie mentioning in her dedicated thread that their version of the Chopper is CW. I can't find the post to verify if there are other changes exclusive to TB. TB is the only vendor I am aware of that sells Chopper's in CW. Some claim their Choppers are CW but actually sell X-150 versions (like Union Garage). According to them, the Insurrection version uses a different leather, lining, hardware and even different sizing. @Carrie @ Thurston Bros. would you have more info? Curious as to what the exact differences are. Thanks.